Finally, the thrill of the chase comes to your d20 campaign! Hot Pursuit: The Definitive d20 Guide to Chases gives Gamemasters the ability to add exciting chase scenes to ANY d20 game - Fantasy, Modern, Future or Past. Written by Corey Reid, Hot Pursuit lets you experience the thrill of the thunder of horse's hooves, the rattle of wagon wheels, the pealing screech of tyres, or the scream of jet engines as your player-characters enact chase scenes to rival those found on the big screen. In Hot Pursuit, chases are given the same focus given to combat, rather than just cursory coverage. Rules are given for the affects of the environment upon the chase, maneuvers (including passenger maneuvers, so that nobody is left out of the excitement), obstacles, mounts, vehicles and more. 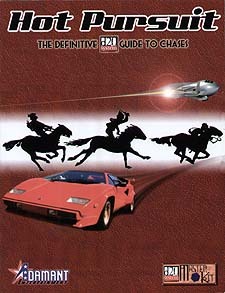 Written for both the core d20 rules and Modern d20, Hot Pursuit: The Definitive d20 Guide to Chases is everything you'll ever need to run chase sequences in your games. regardless of time period or setting.